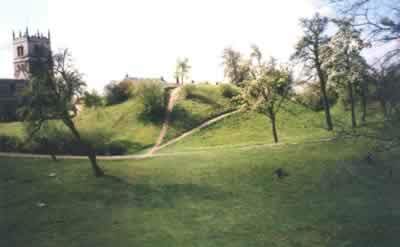 Peel Hill is a Norman earthwork motte, founded by the de Warennes. The large motte encased by a wide ditch, supports the damaged stone foundations of an unusual cylindrical keep, which was flanked by three large buttresses. The castle was probably used as a hunting lodge for Hatfield Forest and in the 16th century, its tower was in use as a prison. In the 17th century, ranges of medieval buildings and a gatehouse stood on the south side of the motte and this could be the position of the lost bailey. 11 miles south-west is Castle Hills Langthwaite and 12 miles north-east at Howden is Bishops Manor House. Peel Hill is located in Thorne, off Church Street. 10 miles north-east of Doncaster, on the M18-A614. The site is owned by the Thorne-Moorends Town Council and is freely accessible in daylight hours.